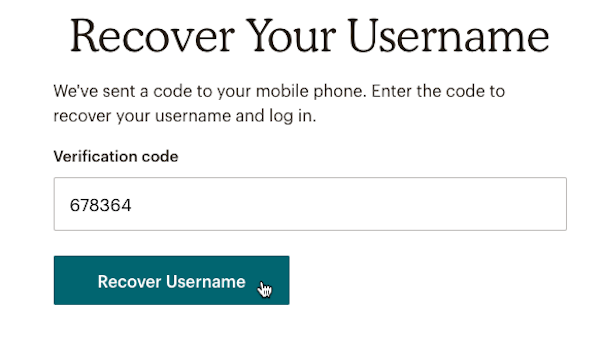 If you forget your Mailchimp username or password, let us know and we’ll send the information you need to access to your account. In this article, you'll learn how to recover your username or reset your password. If you don't have access to the email address on file for your account and need to reset your password, use your verified phone number to update the email address that receives the password reset email. To learn how, read Recover Account with SMS Text Verification. You can recover your username with the email address or mobile number associated with your account profile. 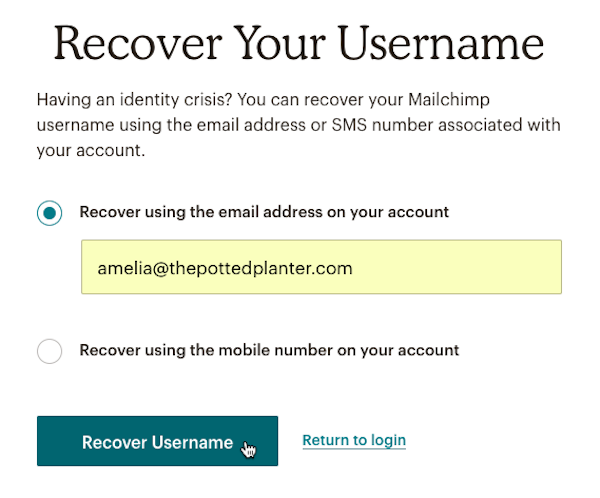 To recover your Mailchimp username by email, follow these steps. 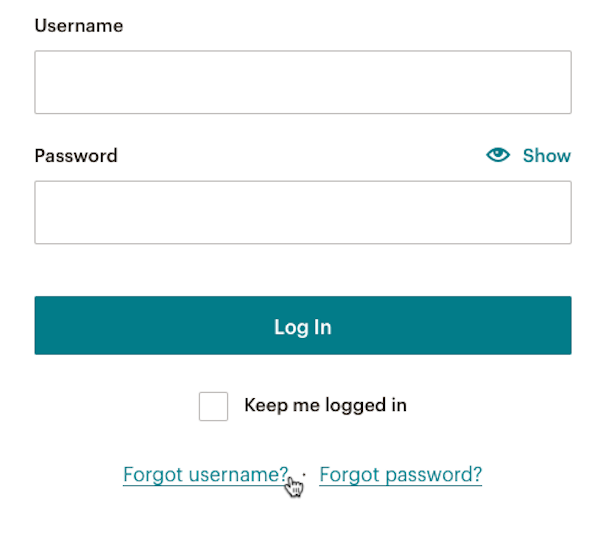 Navigate to the Mailchimp login screen. Click the radio button next to Recover using the email address on your account. Enter your email address and click Recover Username. You'll receive an email from Mailchimp that contains the username or usernames associated with the email address you entered. If you don't receive this email within an hour or two, check your junk or spam folder. In the email, click the link to go to the login screen, where we'll automatically fill in your username. 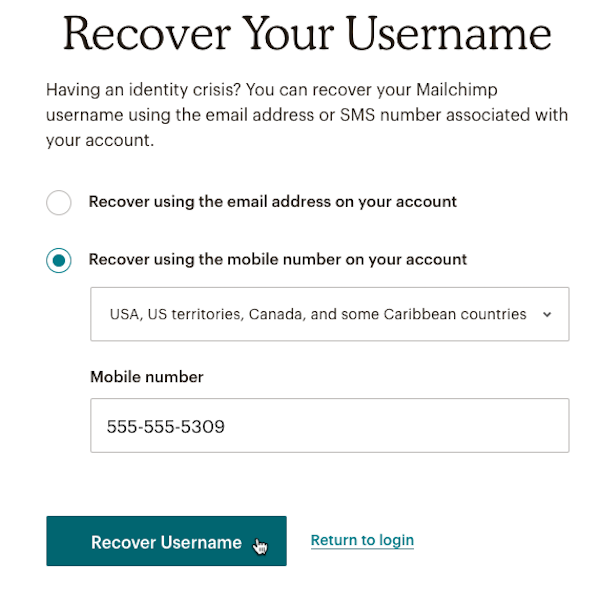 To recover your Mailchimp username using a mobile device, follow these steps. Click the radio button next to Recover using the mobile number on your account. Choose your country from the drop-down menu and type the mobile number associated with the account. Click Recover Username to send a verification code to the mobile number you entered. In the Verification code field, enter the code you receive and click Recover Username to display the usernames attached to that phone number. 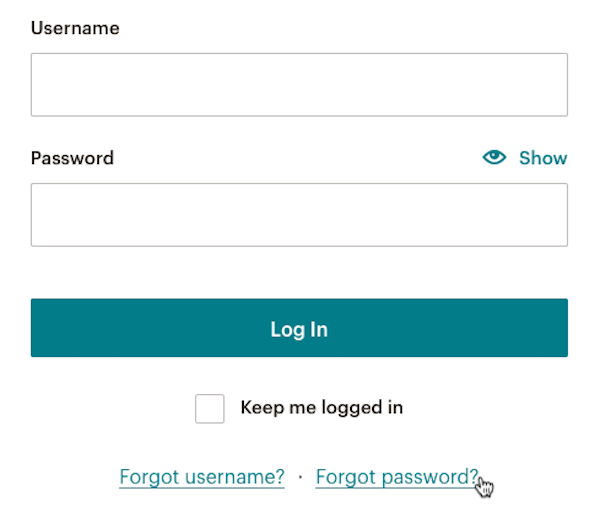 When you forget your Mailchimp password, we’ll send password reset instructions to the email address associated with your account profile. For security purposes, we don't store password information, so we can't give you the existing password on your account. 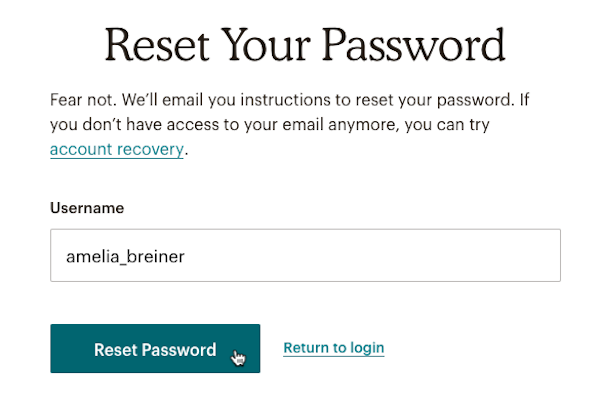 To reset your Mailchimp password, follow these steps. Enter your username and click Reset Password. If you don't receive password reset instructions within an hour or two, check your junk or spam folder. Learn how to recover your account login with SMS text verification. SMS text verification let you receive password resets when you can't access your email.